BUFFALO BILL AND FRED MAY. Mayor Powell of La Crosse Talks of the Cause of Their Fight. 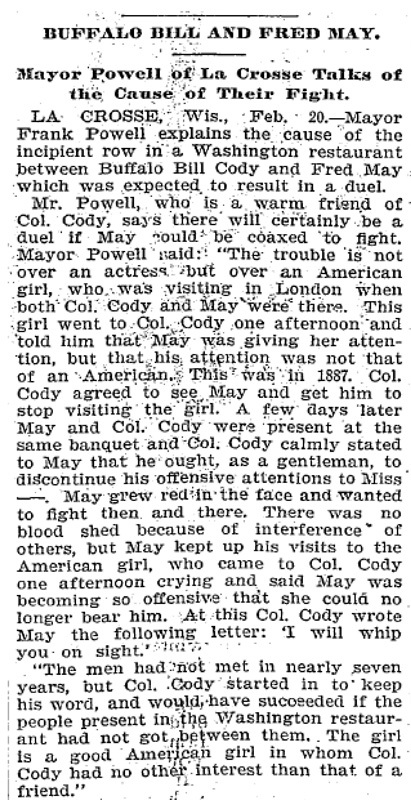 LA CROSSE, Wis., Feb. 20.—Mayor Frank Powell explains the cause of the incipient row in a Washington restaurant between Buffalo Bill Cody and Fred May  which was expected to result in a duel. "The men had not met in nearly seven years, but Col. Cody started in to keep his word, and would have succeeded if the people present in the Washington restaurant had not got between them. The girl is a good American girl in whom Col. Cody had no other interest than that of a friend."